Pumpkin seeds are a satisfying snack for the many healthy eaters who love crunchy foods. Who doesn't love a handful of savory seeds? But whether you make them at home or buy them in the store can make a difference in pumpkin seed calories and pumpkin seed nutrition. You'll consume about 126 calories when you eat a single serving of pumpkin seeds. But it's hard to eat a single serving. A single one-ounce serving is about 85 seeds. 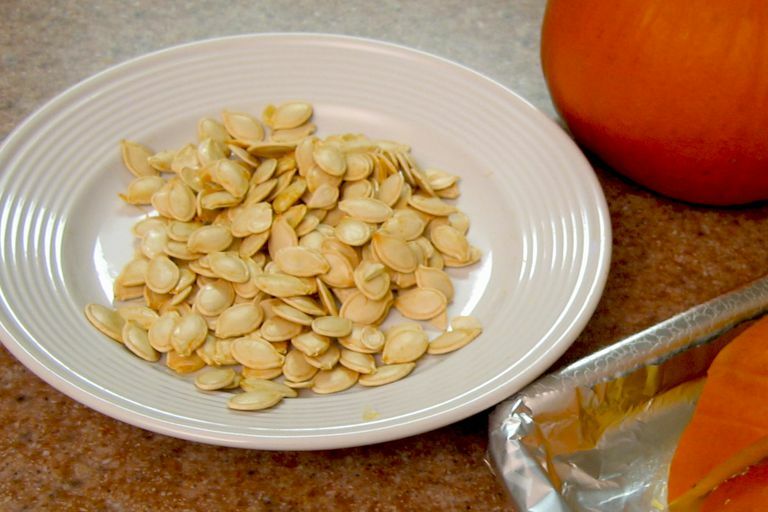 When is the last time you counted your pumpkin seeds before tossing them into your mouth? It's not likely that anyone does. For that reason, pumpkin seed calories can derail your diet if you're trying to slim down. And what if you make your pumpkin seeds at home? Most recipes require that you roast the seeds in oil or butter and sprinkle salt on top. These are the numbers you need to add (for the full recipe) if you use standard roasting methods. If you roast the seeds in one tablespoon of butter, add 102 calories, 12 grams of fat, 7 grams of saturated fat and 2 milligrams of sodium. If you roast the seeds in one tablespoon of olive oil add 119 calories, 14 grams of fat, 1.9 grams of saturated fat (but 10 grams of monounsaturated fat and 1.4 grams of polyunsaturated fat) and zero sodium. If you sprinkle one teaspoon of salt onto your big batch of roasted seeds, add 2325 milligrams of sodium to the nutrition for the entire recipe and divide that amount by the number of servings to find out how much-added sodium you will consume. A single serving of pumpkin seeds provides 15 grams of carbohydrate, but only ten grams of net carbs since the serving also provides five grams of fiber. A full cup of the whole roasted seeds provides 34 carbs and 12 grams of fiber. The estimated glycemic load of a single one-ounce serving is 10. A single serving of pumpkin seeds provides about 5.5 grams of fat. One gram is saturated fat, 1.7grams are monounsaturated fat and 2.5 grams are polyunsaturated fat. You'll benefit from about five grams of protein in a single serving of pumpkin seeds. Pumpkins seeds are not a great source of vitamins but you will benefit from some minerals when you consume this food. Pumpkin seeds are a good source of magnesium, phosphorus, copper, and zinc, according to the USDA. Even if you overeat pumpkin seeds, you are still providing your body with good nutrition—most of the time. Pumpkin seeds without added oil, butter, salt, or seasonings provide a nice boost of both monounsaturated and polyunsaturated fat, known as "healthy fats. Healthy eating experts recommend that we replace saturated fat foods with foods that provide mono- and polyunsaturated fats. Pumpkin seeds are also low in sodium, and relatively high in protein, especially for snack food. The best thing about pumpkin seeds is the dose of diet-friendly fiber you get when you eat them. Eating fiber helps you to curb unruly hunger cravings and eat moderately all day long. If you are trying to reach or maintain a healthy weight, fiber is your friend. But not all pumpkin seeds provide the same benefits. If you buy processed or packaged pumpkin seeds, you're likely to get an extra dose of fat and sodium. For example, popular brands of pumpkin seed packets that you see in the candy store can provide up to three grams of fat and a whopping 815 milligrams of sodium per one-ounce serving. Can I eat pumpkin seeds whole? Yes. It is tricky to remove the shell of the pumpkin seeds. For that reason, many consumers eat them whole. How should I store pumpkin seeds? If you want to use the seeds to plant pumpkins, first dry them then place them in an envelope and store in a dark area until you are ready to use them. When your batch of seeds is roasted for eating, seal them in an airtight container and store at room temperature. Of course, you can grab a small handful of pumpkin seeds to snack on at any time. Although, you'll control portions better if you don't eat them straight from a large container. Instead, measure a few tablespoons from the jar or tub and put them in a bowl. Pumpkin seeds also make a great topping for soups and salads. If you like to make healthy wraps, you can also toss a few into a turkey wrap with hummus for a savory, crunchy meal. If you love eggs in the morning, you can also sprinkle them on top of scrambled or fried eggs. Roasting pumpkin seeds is simple. Just follow these steps. After you remove the seeds from a pumpkin, rinse them thoroughly and remove any stringy, wet pulp that is attached to them. Place them in a bowl and add oil or seasonings if you prefer. Salt is the most popular seasoning, but you can also try paprika, chili powder, parmesan or Indian spices. Some people prefer a sweet taste and add sugar, brown sugar or cinnamon. Spread the seeds in a thin layer on a large cookie sheet. Place in a preheated 300-degree oven for about 30 minutes. Allow your batch of pumpkin seeds to cool slightly before digging in. It is possible to have an allergic reaction to pumpkin, although reports of this allergy are rare. The allergy can develop at any time, according to the American College of Allergy, Asthma and Immunology. Eating pumpkin meat or consuming the seeds can cause an allergic reaction with symptoms that can include chest tightness, hives, and vomiting. If you suspect an allergy to pumpkin, seek care from a healthcare professional. You may also want to exercise caution when consuming pumpkin seeds if you take lithium. The seeds or meat might decrease how well the body gets rid of lithium, according to the Natural Medicines Database This could increase how much lithium is in the body and result in serious side effects.